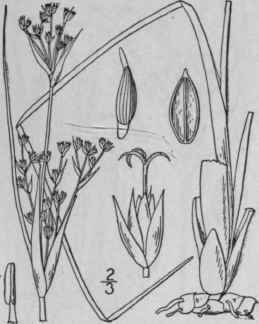 Juncus martimus Lam. Encycl. 3: 264. 1789. Stems 20-40' high, i"-2" thick, erect from a stout horizontal rootstock. Outer basal leaves reduced to bladeless sheaths, the innermost foliose, with a long terete stout blade about equalling the stem; leaf of the inflorescence erect, sometimes 1° long, sometimes barely exceeding the panicle; panicle 3'-8' high, its branches stiff, erect; heads 2-6-flowered; perianth 1 1/2"-1 3/4" long, its parts green, lanceolate, with hyaline margins, the outer acuminate, the inner a little shorter; flowers perfect; stamens 6, two-thirds as long as the perianth; filaments about as long as the anthers; capsule 1 1/2"-1 3/4" long, narrowly ovoid, acute, mu-cronate, brown above, 3-celled, with thin placentae; seed brown, about i" long, the body narrowly and obliquely oblong, about 1" in length, 20-30-ribbed, indistinctly reticulate, tailed at either end. Coney Island, New York, the station now, perhaps, destroyed. Common on the coasts of the eastern hemisphere. juncus bufonius L. Sp. PL 328. 1753. 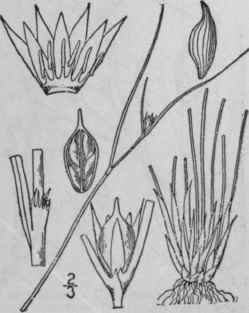 Plant branching from the base, annual, erect, seldom exceeding 8' in height, the stems in large plants with 1 or 2 leaves below the inflorescence; leaf-blade flat, i"-i" wide, in low plants often much narrower and filiform-involute; inflorescence about one-half as high as the plant, with blade-bearing leaves at the lower nodes; flowers inserted singly on its branches, in one form fasciculate; perianth-parts 2"-3 1/2" long, lanceolate, acuminate, equal; stamens usually 6, sometimes 3, seldom half as long as the perianth; anthers shorter than the filaments; capsule about two-thirds as long as the perianth; narrowly oblong, obtuse, mucronate, 3-celled; seed broadly oblong, with straight tips, 1/6"-1/4" long, minutely reticulate in 30-40 longitudinal rows, the areolae broader than long. A cosmopolitan species, occurring throughout North America, except the extreme north, frequenting dried-up pools, borders of streams and roadsides in clayey soil. Frog, Toad or Coe-grass. Salt-weed. 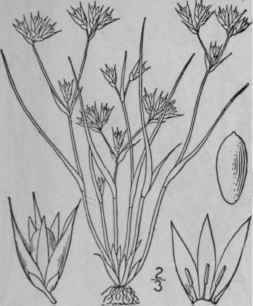 Juncus trifidus L. Sp. PI. 326. 1753. Densely tufted, 4'-12' high; stems closely set on a it rootstock, erect, about 1/4" thick; basal leaves reduced to almost bladeless sheaths, the uppermost with a rudimentary blade and fimbriate auricles; stem-leaf 1, inserted near the inflorescence, with a narrower slender, flat or involute blade; inflorescence a cluster of 1-3 flowers, the lowest subtending bract similar to the stem-leaf, the succeeding one much smaller or wanting; perianth dark brown, 1 1/4"-1 3/4" long; stamens 6; anthers about as long as the filaments; capsule equalling the perianth, coriaceous, 3-celled, obovoid with a conspicuously mucronate-aristate top; seeds few, narrowly obovoid, acute at the base, irregularly angled, minutely striate both longitudinally and transversely. Greenland and Labrador, south on the higher mountains of New England and New York to Sam's Point, N. Y., and in North Carolina. Also in Europe and Asia.